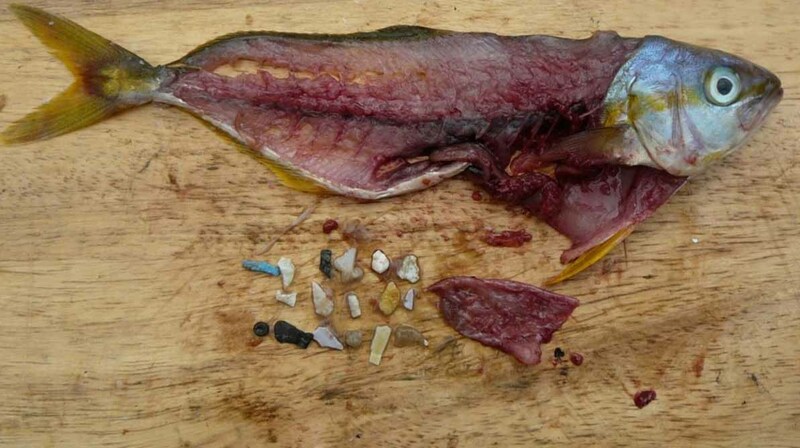 A rainbow runner caught the North Pacific Gyre is dissected to reveal the fish ingested more than a dozen pieces of plastic, including microplastic particles less than 5 millimeters in diameter. Experts on aquatic microplastic pollution will convene at SCCWRP in April for a two-day meeting exploring how to develop standardized methods for monitoring microplastics. Leading international experts on aquatic microplastic pollution will convene at SCCWRP this spring to begin exploring how California could monitor microplastic particles in drinking water and the coastal ocean, a response to newly enacted legislation. During a two-day meeting scheduled for April 4-5, microplastics experts from around the world will discuss how to develop standardized methods for measuring microplastic particles in aquatic environments statewide. California Senate Bill 1422, which was signed into law in September 2018, requires the State Water Board to develop plans for quantifying microplastic particles in drinking water by 2021. Similarly, California Senate Bill 1263, also signed into law in September 2018, requires the California Ocean Protection Council to adopt and implement a statewide strategy for illuminating the ecological risks of microplastics in marine environments. Defined as plastic particles less than 5 mm in diameter, microplastics have become ubiquitous in aquatic environments, even as scientists have relatively little understanding of their health impacts for humans and wildlife that ingest microplastics. Since November, SCCWRP and its partners have been working to bring together leading scientific experts on microplastics to develop a study plan for evaluating and standardizing measurement methods. Particularly challenging are microplastics so small that they’re invisible to the naked eye. Microplastics have been documented in the guts of fish and other marine life; they’ve also been found in human feces. In aquatic environments, chemical contaminants can stick to microplastics, compounding the health risks for organisms that inadvertently ingest microplastics. In California, most trash management programs to date have focused on curbing the spread of larger trash particles in aquatic environments. Larger plastic particles, however, can break down in aquatic environments to become microplastics. SCCWRP and its member agencies have been working for more than two decades to document the presence of microplastics in aquatic environments. Beginning in the late 1990s, researchers completed a series of studies that showed tiny plastic pellets known as preproduction plastic pellets have become a ubiquitous presence in Southern California beach sand. SCCWRP and its partners also have documented the prevalence of tiny plastic debris particles in Southern California’s ocean, including a Southern California Bight 2013 Regional Monitoring Program study that found microplastics had accumulated in more than one-third of Bight seafloor sediment. The microplastics workshop, open to the public, will be co-hosted by scientific instrumentation company HORIBA, the University of Toronto and SCCWRP. RSVPs are required via the workshop’s Eventbrite registration page. For more information, contact Shelly Moore.